Ruler Analytics is a call tracking and marketing attribution software that offers SMBs a single and centralized platform from which to capture, share and analyze marketing campaign data. Incorporating phone call tracking, form tracking and Google Analytics integration, Ruler Analytics aims to deliver a comprehensive marketing attribution solution. In order to attribute marketing data effectively, Ruler Analytics equips users with campaign and keyword call tracking technology. Utilizing Ruler Analytics’ call tracking functionality, users can match phone calls to website visitors and determine exactly how visitors discover a user’s business. Users can also view the caller journey, listen to call recordings as well as track static and offline calls. Moreover, by supporting Google Adwords and Analytics integrations, Ruler Analytics allows users to capture phone call data as Goals and conversions and, ultimately, measure the ROI on their marketing investment. Besides call tracking, Ruler Analytics facilitates form tracking alongside company tracking. With Ruler Analytics’ advanced tracking features, users can collect customer data from abandoned forms and obtain the contact details of real companies which have visited their website. Further to Google Analytics integration, Ruler Analytics supports Zapier integration. Through Zapier integration, Ruler Analytics connects seamlessly to more than 500 other services including CRM and Email products such as MailChimp, pipedrive and Microsoft Dynamics. Ruler Analytics, therefore, allows users to share marketing data easily with their CRM and order management systems as well as understand more about their customers with visitor journey tracking and enriched lead information. More features, integrations and solutions. At a cheaper price. Good experience all round. Cost, Number of Integrations, Customer Support, Form and Online Chat Tracking is additionally valuable. Finally being able to match multiple clicks to forms AND calls leads is really valuable for me and my agency. Maybe too many features, at first I was looking for cost effective call tracking but didn't realise they did this as well. Delighted to have moved solutions to Ruler now though, better product/better price. 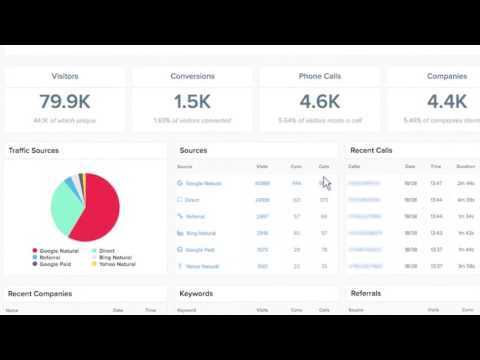 Great kit for tracking calls and leads from your marketing channels. Great kit for tracking calls and leads from your marketing channels. Being able to demonstrate every enquiry to a client is essential and Ruler makes it easier. Ruler Analytics offers 3 pricing tiers. Enterprise plan: To receive accurate pricing, contact Ruler Analytics directly. Ruler Analytics employs phone call tracking technology, allowing users to match phone calls to website visitors as well as reveal specifically how visitors found the user’s website. Ruler Analytics facilitates form tracking, serving to help users collect customer data from abandoned forms effectively. Thanks to third party integration with Zapier, users can connect seamlessly to hundreds of different applications including popular CRM and email services such as MailChimp and Zoho CRM. Ruler Analytics extends visitor journey tracking technology, providing users with an accurate account of every individual visitor’s journey on their website across multiple sessions. Ruler Analytics features re-provided keywords, offering users the keywords that Google Analytics has removed and reports as not provided and matching them correctly against phone calls and form conversions. Below are some frequently asked questions for Ruler Analytics. Q. What type of pricing plans does Ruler Analytics offer? Q. Who are the typical users of Ruler Analytics? Q. What languages does Ruler Analytics support? Q. Does Ruler Analytics support mobile devices? Q. Does Ruler Analytics offer an API? No, Ruler Analytics does not have an API available. Q. What other apps does Ruler Analytics integrate with? Q. What level of support does Ruler Analytics offer?